Imagine a 60-pound, muscular dog with a big, blocky head and brindle coloring, and chances are you either imagined a pit bull or a boxer. The American pit bull terrier, often just called a pit bull, and the boxer are similar dogs in many respects. They are both muscular, playful, loving companions who were bred from bulldogs and terriers in the late 1800s. There are some significant differences between the breeds, though, about which aspiring owners should know, including the potential legal issues associated with owning a pit bull and the many potential health problems associated with the boxer breed. Both the American pit bull terrier and the boxer are known as "bully breeds," meaning they both were bred from the bulldog. They were also bred into their modern versions starting in the 1800s, one in the United Kingdom and one in Germany. Pit bull: According to the United Kennel Club, during the 1800s, breeders in the U.K. started crossing bulldogs and terriers to find a dog with the eagerness and hunting tenacity of a terrier and the strength and athleticism of a bulldog. The resulting pit bull terrier was strong and courageous but still gentle with its loved ones. Immigrants brought these pit bulls with them to the United States, where they gained popularity with farmers and ranchers who found they were good with hunting, driving livestock, and being family companions. Boxer: Like the pit bull, the boxer is a mix of bulldogs and terriers for the most part. However, while the pit bull was bred in the U.K. from old English bulldogs, the American Kennel Club says the boxer was bred in the late 1800s from the German bulldog (also called the bullenbeisser), terriers, and mastiffs. When first registered with the AKC, the dog was named "boxer" for his distinctive play style, where he rears up his front leg and "punches" his companion. According to the UKC, the breed was relatively unpopular outside of Germany until the 1940s, but their use in the military during World War II made them popular with returning service members. Generally speaking, when it comes to boxer vs. pit bull appearance, boxers are bigger than pit bulls both in height and weight. It's worth noting, however, that there is a good amount of variety in pit bull sizes, and they may be much larger or smaller than the average size. A typical boxer will stand 21 to 25 inches tall and weigh 65 to 80 pounds. Pit bulls may be 17 to 21 inches tall and weigh 30 to 60 pounds, although there may be far more variation in pit bull sizes. Boxers have a large rib cage, long legs, and a small waist, and while they are muscular, they tend to be sleek and are rarely bulky. On the other hand, a pit bull is generally thicker throughout her torso, with more well-defined musculature. Because the torso is a little shorter, the legs are shorter, and the body is thicker, pit bulls of similar sizes tend to look larger than boxers even though boxers tend to be larger dogs overall. While pit bulls and boxers are frequently seen in the same colors, that's only because pit bulls can come in any color except merle (the splotchy, mottled color pattern commonly seen on cattle dogs). Boxers, on the other hand, can only come in light to dark fawn or brindle with black stripes on a golden yellow or reddish-brown background. Boxers can have white markings as well, but they must have a black face. Both the pit bull and boxer have big, blocky heads, which is a remnant trait from their shared bulldog ancestry. That being said, the boxer has a short, almost square muzzle and long jowls that hang over the side of his mouth. The dog's bottom jaw is longer than its upper jaw, although only marginally. The pit bull's muzzle, on the other hand, is just slightly shorter than the rest of his head, and while some have floppy jowls, their lips are supposed to be tight according to the breed standards. The pit bull's bottom jaw should be shorter than the top, like most dogs. Pit bulls have ears closer together, sitting high on the head, whereas the boxer's ears are located on either side of its head. 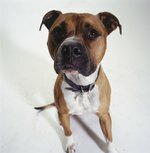 While both breeds often have cropped ears, when left natural, a pit bull's ears sit up a little before falling over halfway up, and a boxer's ears lay mostly flat against the dog's cheeks. While boxers generally have docked tails because it is part of the dog's traditional breed standard, the removal is not necessary and is done purely for looks. When boxers do not have docked tails, their tails sit high and tend to curve upward toward the spine. Pit bulls generally do not have docked tails, and their medium-length tails line up with the rest of their spine, hanging low when relaxed and raised up when excited. While people often think of pit bulls as being more serious and fearsome than the friendly, playful boxer, the two dogs are actually very similar when it comes to personality. Obviously, there are variations from each individual dog to the next, but overall, both pit bulls and boxers are friendly, playful, and happy dogs who love people. They are both good with children, acting patient, protective, playful, and gentle around little ones, according to Pet Gear Lab. Neither dog was bred to be a guard dog, but they are cautious around strangers and will protect their family members if their loved ones are in danger. That being said, pit bulls are notably worse guard dogs than boxers because they love people and will often let strangers in the home unless they feel their family is threatened. Of course, sometimes just seeing a pit bull inside a home is enough to make someone think twice about breaking in. Both boxers and pit bulls are muscular, playful breeds, meaning they need ample exercise. They also should be given lots of socialization from a young age to ensure they are comfortable around an array of animals, people, situations, and experiences. If you want your pit bull to get along with other dogs or animals, this is particularly important, as they do have fighting and hunting traits in their breeding stock and may have a natural propensity to attack other animals. Boxers are prone to more health problems than pit bulls, which is why they tend to have shorter life spans. While pit bulls can live 10 to 15 years, according to Vetstreet, boxers tend to live only 8 to 10 years. In fact, pit bulls are a relatively healthy breed and are only prone to hip dysplasia, allergies, hypothyroidism, and demodectic mange, which are common problems among many breeds. Pit bulls were long used for hunting and fighting purposes, and these instincts can run strong in the breed, meaning many of the dogs will be aggressive toward other dogs and animals. That being said, pit bulls were not bred to be guard dogs but companion pets, and even mild aggression toward humans was seen as a problem to be bred out of the dogs. As a result, most pit bulls are friendly and loving toward humans, even young children. Unfortunately, a small number of bad breeders and owners encourage aggression among their pit bulls, and when these dogs attack humans, the stories often end up in the news. This means many people look at pit bulls and assume they are violent, vicious dogs. While some dog owners do not mind having a literal "underdog" that they constantly have to defend from negativity, others will not want to deal with the social stigma and even potential hatred associated with owning a pit bull, as HerePup warns. Boxer owners will rarely have to deal with these issues, although people who have personally had bad experiences with the breed may still exhibit negative reactions. Due to the negative public perception of the pit bull as an aggressive, vicious breed, many cities and even whole countries (including Germany, the U.K., Spain, and France, according to PetoLog) have banned the breed. While no states have outright banned pit bulls, the American Society for the Prevention of Cruelty to Animals notes that over 700 cities in the U.S. have what are known as "breed-specific legislation," meaning laws that prohibit the ownership of certain dog breeds. This is in spite of the fact that the Centers for Disease Control has shown that breed-specific laws do not make communities safer for people or companion animals. Boxers are not generally subject to such laws. While some landlords may refuse to rent homes to anyone who owns any bully breed, including boxers, pit bulls are on these lists far more often, so even if you live in an area where pit bulls are legal, you may have a difficult time finding a property to rent. If you are a home owner in a city with no breed restrictions, you won't need to worry about this, but if not, it's something to think about before adopting a pit bull. Many insurance companies have similar prohibitions against covering bully breeds in homeowners' or renters' policies, but these policies more frequently discriminate against pit bulls specifically.